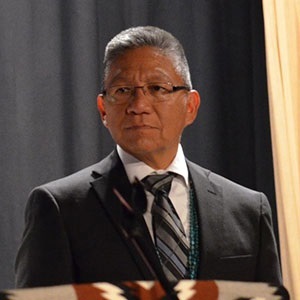 Navajo Nation Vice President Myron Lizer told Rehoboth Christian School sixth graders that tribal sovereignty is a “powerful privilege for the Navajo Nation.” Lizer spoke to the Nikki VanSlooten’s 20 students on February 5. Lizer discussed the significance of the “Long Walk” and the Navajo Treaty of 1868. In 1864 the Navajo people were forcefully removed from their homelands and forced to walk 300 miles to Bosque Redondo, N.M. The signing of the Treaty of 1868 allowed the Navajo people to return to their homelands and establish a government-to-government relationship with the United States. In order to lead, guide and protect their people, a leader must live in good faith, Lizer told the students. Being a leader by good faith helps to build good relations with people, communities and other nations, the vice president said. It also promotes strength and unity to overcome challenges, Lizer added. Rehoboth Christian School is located east of Gallup, N.M.